The HC-05 zs-040 modules have a voltage regular on then vcc in line. This means they can accept an in voltage from 3.6 to 6v and can be powered from the Arduinos 5V out. However, the data pins are not 5v, they are 3.3v only. This means we need to reduce the 5v from the Arduino TX pin to 3.3v. One easy method is to use a voltage divider made from a couple of resistors. I am using a 1K ohm and a 2K ohm resistor. The voltage divider is using a 1K ohm resistor and a 2K ohm resistor. The following sketch waits for the user to put the HC-05 in to AT mode and then simply copies what ever is entered in the serial monitor to the HC-05. // Basic Bluetooth test sketch 5a for the Arduino Mega. When you first power on, the LED on the BT module will flash quickly, about 5 (I think) times per second. To change to AT mode. Remove power to the HC-05, press and hold the little button switch, reconnect power (while the button switch is held closed). The flash on the LED should change to on/off every 2 seconds, 1 second on, 1 second off. This indicates AT mode. You can now release the button switch. 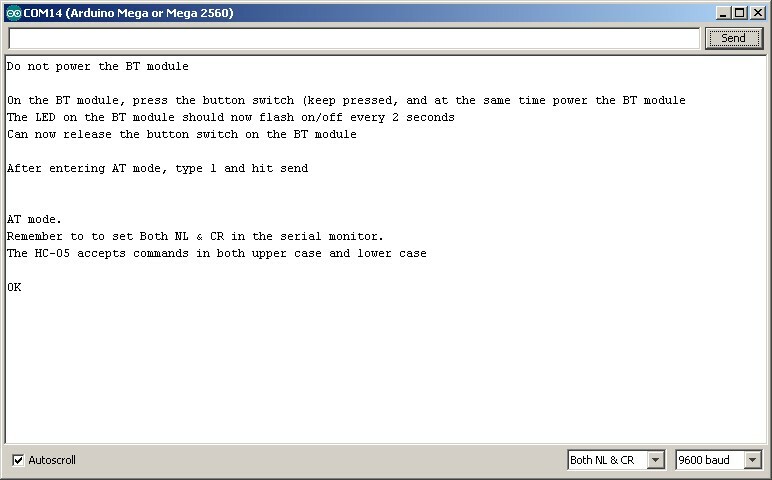 The button switch, when closed, connects pin 34 of the small BT module to 3.3v. When pin 34 is HIGH on start up, the module goes in to AT Mode. Releasing the button switch takes pin 34 back to not connected and this puts the module in to a “mini” AT mode and not all commands work. 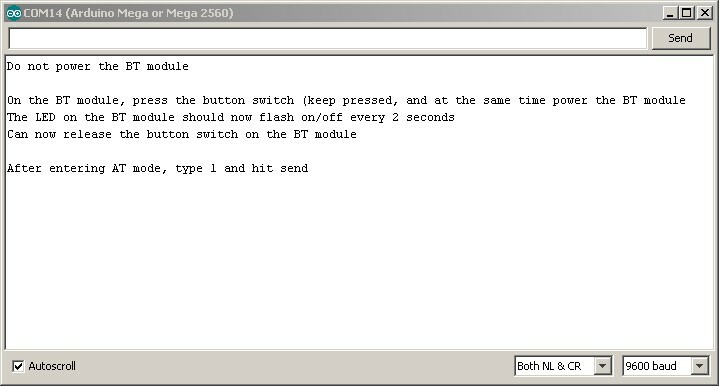 There is also a “full” AT Mode which requires pin 34 to be HIGH all the time. To confirm everything is working enter AT and hit send. If all is well you will see “OK”. If you get error(0). Re-enter the “AT”. The error means extra characters have not been cleared from the serial buffer. To change the role to MASTER use: AT+ROLE=1\r\n. Note the equals sign. These module expect an equals sign. The below sketch is for Jesus and was not tested at the time of posting. // Basic Bluetooth test sketch 5b for the Arduino Mega. // Arduino will relay it to the Bluetooth module. Your sketch works fine now for me. I could resolve the problem I had. Now it seems very easy, at the end, but I was very busy looking for the bug. I’m sorry for bothering you, bro. But, I’ve done everything as you said and I still can’t receive any answer from BT module when typing “1” or “AT” (without cotes). Everything is equal you did, except by res (660 ohms and 330 ohms) and the module (FC-114/HC-05, but I think they both are the same). Do you have any clue about what could be causing the lack of transmission? PS. : I changed the pins 18 to 19 and vice-versa, but nothing changed. The FC-114 modules have a different firmware and are in AT mode when they start. how would I put the HC 06 JY MCU to AT mode? I haven’t used the JY-MCU boards but the HC-06 should be in AT mode on start up. The default baud rate is usually 9600. 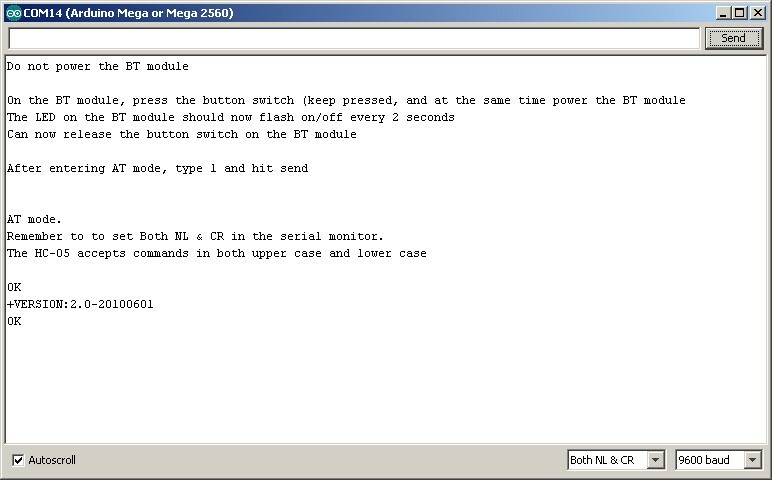 Connect using 9600 and enter AT in the serial monitor. 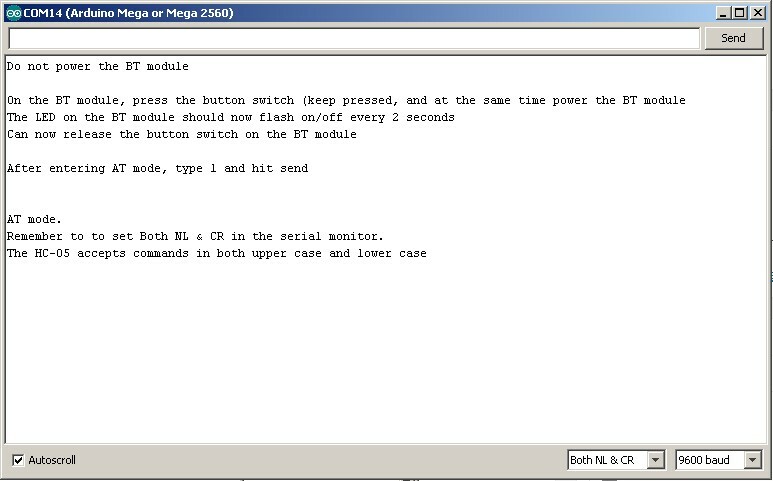 The HC-06 does not like to have carriage return and new line characters so set the serial monitor to “No line ending”. You should get an “OK” reply. Thanks for your article!! It really help me a lot to setup bluetooth communication. I am able to transmit data from the Arduino zero board to bluetooth terminal but vice versa is not happening. Any clue on this? 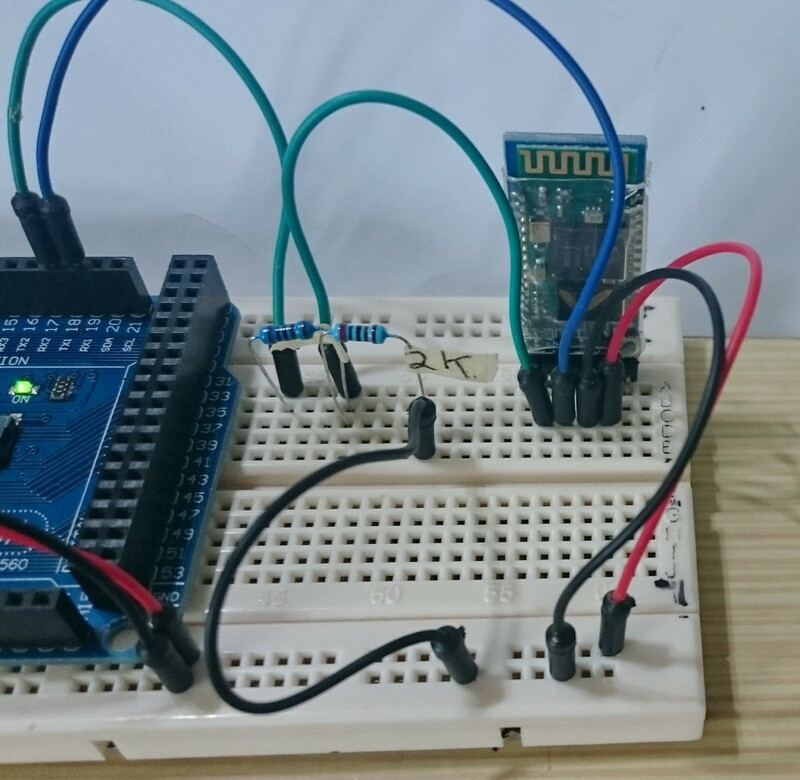 Note: I have not put voltage divider circuit on transmit line( HC-05 RX to Arduino pin D3 (TX) via a voltage divider) but as per my understanding transmission from Arduino zero board to bluetooth terminal should be affected because of this and not reception. Yes, since the Zero is a 3.3v device it does not need a voltage divider. Are you using software serial or hardware serial? Please note I don’t have a Zero and my knowledge about them is very limited. Why does this example show a voltage divider? Arduino Mega comes equipped with a 3.3 v pin. Seems like more work than necessary. The voltage divider in on the data line (Arduino TX to BT RX) not the power line. The Mega data pins are 5V. good morning i have same hco5 with couple 1,5ohm resistors 5v->2,5v what do you think will i get my at commands back into serial monitor? or it will not work? I honestly don’t know but I doubt it. Normally 1.8v is the minimum for a HIGH. All I can suggest is try it and see if it works. hello…. can i interface this bluetooth module with raspberry pi? yes but I have no idea how. Hi. U say we need resistors between arduino Tx and hc05 rx. Okay i got the logic but i dont understand something u just only connect one of these resistors between arduino tx to BT rx. Because in pic u seperate and use 2.nd resistor to connect GNd. I completely am lost! This not something I can answer directly. It all depends on your final sketch / project. However, the 328P Arduinos are more widely used and better supported. For somebody learning Arduino it may be better to stay with one of the regular boards. Personally, I use 328P based Nanos for almost everything. I have a couple of Megas but they never get used. I learnt far more squeezing large sketches in to the small Arduinos than I would ever have if I simply used a mega but my motivation may be different to yours. For me the puzzle solving and learning new things is more important than the final project. no, I am saying you need to decide which Arduino to use yourself. If you are not sure you need to research the pros and cons for each model based on what you want to do. There are lots of resources online, take some time and go through the ones that you feel are relevant to you. Double check the resistor values. Make sure the resistors are the right way around. Thanks and keep up the good work MC. That worked for me also. Thank you.